Housing is still sluggish based on the latest starts data which disappointed. Starts in March slightly rebounded a monthly 2.0 percent after plunging a monthly 15.3 percent in February. Expectations were for a 1.040 million pace for February. The 0.926 million unit pace was down 2.5 percent on a year-ago basis. By region, starts gained 114.9 percent in the Northeast-almost certainly a weather related rebound but in a small region. The Midwest also saw a weather related gain of 31.3 percent. However, the large South region declined 3.5 percent and the West fell 19.3 percent. Housing permits were a little stronger but still disappointed, falling 5.7 percent after gaining 4.0 percent in February. The 1.039 million unit pace was up 2.9 percent on a year-ago basis. The median market forecast was for a 1.085 million unit pace. Overall, housing is still soft even with weather improving. The latest data will likely keep the Fed on the loose side in the near term. Housing starts unexpectedly fell sharply in February. Starts fell a monthly 17.0 percent, following no change in January. The 0.897 million unit pace was down 3.3 percent on a year-ago basis. This was the lowest starts level since January 2014 with a 0.897 million unit annualized pace. Adverse winter weather likely played a role. Single-family units dipped 14.9 percent in February, following a 3.9 percent decrease the month before. Multifamily units dropped 20.8 percent after rising 7.9 percent in January. Housing permits, however, were more positive, gaining 3.0 percent after no change in January. The 1.092 million unit pace was up 7.7 percent on a year-ago basis. 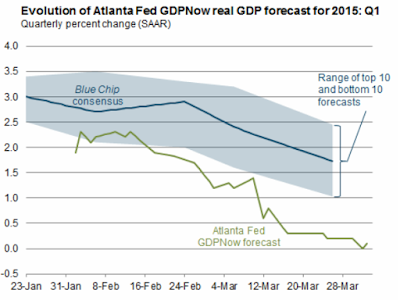 The Atlanta Fed's GDPNow Forecast ticked down to 0.1% growth for the quarter, based on yesterday's poor Industrial Production numbers. Today's poor showing in the Philly Fed manufacturing survey (see Philly Fed Positive, but New Orders Stall, Backlog of Orders Contracts, Prices Contract; Why the Optimism?) 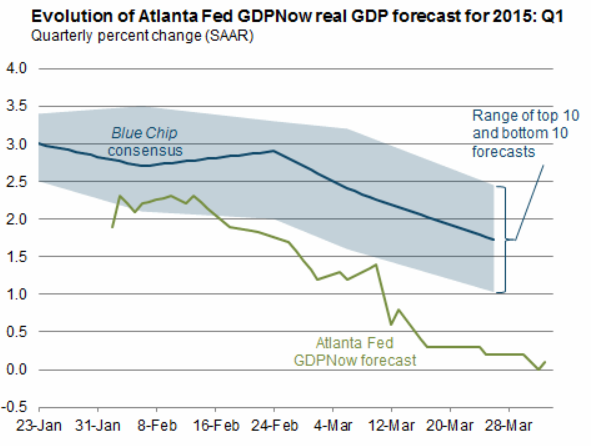 coupled with weakness in housing, I would expect the GDPNow forecast to decline back to zero, if not negative.